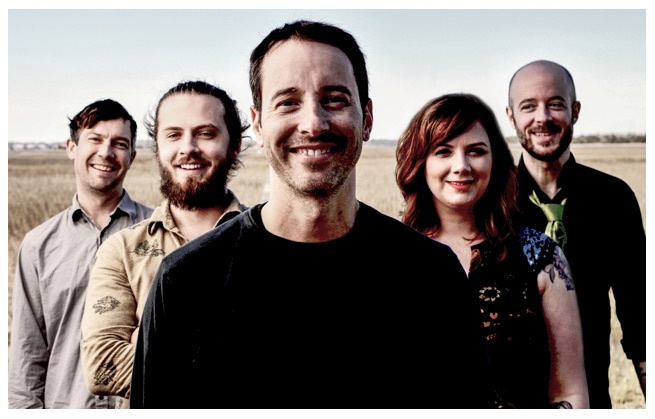 Bman's Blues Report: Yonder Mountain String Band Announces New Band Member Line-Up! Yonder Mountain String Band Announces New Band Member Line-Up! Boulder, CO -- Tuesday, May 12, 2015 -- Embarking on the June 16, 2015 release of their latest full-length studio album, Black Sheep (Frog Pad Records), Yonder Mountain String Band (YMSB) officially announces today its new band member line-up moving forward, which features the additions of violinist Allie Kral and mandolin virtuoso Jacob Jolliff. Joining founding members Adam Aijala (guitar, vocals), Dave Johnston (banjo, vocals) and Ben Kaufmann (bass, vocals), Kral and Jolliff have been touring with YMSB over the past year and appear on Black Sheep. Black Sheep marks the first time in Yonder's history that they're utilizing, throughout an entire record, the conventional five-piece instrumental arsenal of bluegrass introduced in the 1940s: guitar, mandolin, banjo, fiddle and bass. YMSB is available for interviews upon request. Jolliff is an award-winning mandolinist (First Place, The National Mandolin Championship 2012, Walnut Valley Festival, Winfield, KS), and was a longtime member of the Americana band, Joy Kills Sorrow. He's performed with many of today's most distinguished mandolin players, including Ronnie McCoury, Chris Thile, Sam Bush, and David Grisman. Kral is well-known as the former fiddle player for Cornmeal (2003 - 2013), and she's worked alongside various notable artists such as Warren Haynes, moe., and Railroad Earth. With the addition of these two standout musicians, YMSB sets forth on its new path of re-exhibiting itself and broadening its parameters. "Just months ago, we were playing music for the first time together," says Allie Kral. "We were getting to know one another and 'testing the waters' so to speak. What we found was that we have the dedication and the drive to practice all day long, the hearts to hang out together as friends, and the souls to play together on that stage. I'm equally blessed and humbled to become a member of Yonder Mountain String Band, and forever a Kinfolk." Jacob Jolliff adds, "It's been such an honor and a privilege to perform with Yonder Mountain String Band for the last year. I'm so grateful to the band for the opportunity, and to the fans for being so welcoming. I'm excited to continue to spend time with these great people, and push each other to make better and better music!" "Playing with Jake and Allie, working with them in the studio, and traveling with them has been a real blast," says Dave Johnston. "I couldn't have anticipated how they have simultaneously provided a host of great possibilities and potential for Yonder Mountain while at the same time fitting in with our vibe. They are truly part of our Yonder family and I welcome the days to come." It's apparent that Black Sheep is the work of a new Yonder Mountain String Band. While it's immediately recognizable as YMSB music, there's undeniably a raw aesthetic to the studio tracks -- a sense of daring is embedded in both the instrumental interaction between these five singular musicians and in the lyrical content of each song. With the band's 17th anniversary coming this summer, YMSB continues to redefine bluegrass music as they expand the traditional acoustic genre beyond its previously established boundaries by steadily pushing the envelope into the realms of rock n' roll and improvisation. Commencing in May 2015 and running throughout the rest of the year, YMSB performs at premier music festivals and venues, including Dear Jerry: Celebrating the Music of Jerry Garcia (May 14: Merriweather Post Pavilion, Columbia, MD), Summer Camp Festival (May 22 - 24: Chillicothe, IL), Rooster Walk Music & Arts Festival (May 23: Axton, VA), Blue Ox Festival (June 11 - 13: Eau Claire, WI), Telluride Bluegrass Festival (June 17 - 20: Telluride, CO), Electric Forest (June 28: Rothbury, MI), Brooklyn Bowl (July 7: Brooklyn, NY), All Good Music Festival (July 11: Summit Point, WV), Mountain Sol Festival (July 12: Felton, CA), Northwest String Summit (July 16 - 19: North Plains, OR), Hinterland Music Festival (August 1: Des Moines, IA), Red Rocks Amphitheatre (August 21: Morrison, CO), Hangtown Halloween (October 22 - 24: Placerville, CA), Strings & Sol (Dec. 10 - 14: Puerto Morelos, Mexico), and many others!